Served from the can in an Ohio State shaker pint glass. I just couldn't resist trying one of these. It pours a clear brass topped by a finger or so of short-lived off-white foam. The nose comprises sweet corn, light perfume-y vinyl, and a touch of grass. The taste brings in more of the same, the corn and vinyl really taking command and somehow conceiving a half-robotic (read: metallic) lovechild. The body is a light medium, with a light moderate carbonation and a wet feel. Overall, it's not terrible, but rather kinda bad. I can get behind it for a bit of a slum night or something. A: Pours a clear pale to medium golden yellow in color with moderate to heavy amounts of active visible carbonation rising quickly from the bottom of the glass and some faint golden apricot highlights. The beer has a two finger tall foamy off-white head that reduces to a couple of small thick patches surrounded by a mottled thin film covering the majority of remainder of the surface of the beer and a medium thick ring at the edges of the glass. Moderate amounts of lacing are observed. S: Light to moderate aromas of grainy malts and just a hint of grassy + floral hops. T: Upfront there is a lightly sweet grainy malts and just a touch of grassy + floral hops in the finish. Light amounts of bitterness in the finish which fades quickly. M: Just shy of medium bodied with a moderate amount of carbonation. Creamy. O: Very creamy and enjoyable, extremely easy to drink on this very warm late spring evening. A good idea for a good cause and worth grabbing (especially at $1 a 16 oz. can). Alright, so...this is a cool concept, good-looking can, charitable, and for a good cause. I'm a little apprehensive that even according to the (single-page, 4-ish paragraph) website, it's only available at Walgreens and other such fine establishments. We'll see. I suppose it looks enough like a cream ale. It's a very pale yellow, clear but somewhat dull rather than bright. The head is more of a dusting than anything else, but at least that holds up. It even throws down some speckling as it goes. Pale, almost buttery malts, a little herb, some corn but no overly offensive creamed corn, and a green grape sort of sweet/tart note make up the aroma. The flavor is pretty much the same but with more apple skin sour tartness to cut something like a Kool-Aid sweetness. If it didn't have the leafy bitterness, light at it is, or the decent enough base of malts for the style, it could be a lot worse. As it is, it's not as bad as I've heard some describe it. The feel is at once a little too slick and strongly crisp, mildly smooth while some leaf makes for a woolly feel just in the end. Poured from a 16oz can (assumingly the only way it comes) into a pint glass. Copper color with a nice, frothy head. Has a malty smell, with little to no hop presence. No overpowering creamed corn smell. Tastes rather mellow with no hop bite. Slightly creamy (as in Genny Cream Ale smoothness). No cloying or astringent qualities. Light and easy mouthfeel. No disparaging thickness, not super bubbly. Pours a hazy orange with a foamy tan head that settles to wisps of film on top of the beer. Tiny dots of lace slowly drip into the remaining beer on the drink down. Smell is of malt, grain, and sugary cream soda aromas. Taste is much the same with super sweet malt and vanilla like flavors on the finish. This beer has a good level of carbonation with a crisp mouthfeel. Overall, this is a pretty poor beer that drinks more like a cream soda than a beer in my opinion. This beer was purchased in pint cans from Walgreens in Florida. After some research, I ascertained that this beer is brewed by World Brews for Walgreens. This ale was fair at best. It had a flat mouthfeel and a completely average taste. It would be an OK choice if you needed something cold, quick and cheap, but at $1 a can, next time I'll opt for the PBRs right next to them on the shelf. Give it a try so you can say you did...then move on to something better. I was thrilled when I saw the ale and it's outrageous can. It seemed like a joke of course, but I'm glad I tried it. A nice substitute to the everyday cheap beer. A: 16 oz tall boy. Lots of head. Medium carbonation. Lot darker than I expected. Copper/golden. Clear. 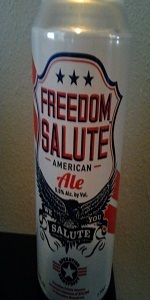 T: Can taste ever bit of malty stale brokeass beer company that brewed it. Metallic. Deadly. Mellow. Smooth. M: Malty. Strong stale taste. No foam or carbonation feel. O: four pack is so bad that I am actively trying to give it away. It is like a Steel Reserve without the alcohol. I may just put it in a dish and hope some stray cats drink it. I am doubting it will attract more than flies. It's on sale in local 99 cents store, for 79c a can. It's Ok ale, considering the price and all. Nothing special, no depth whatsoever , but at least no nasty aftertaste. Acceptable. Not a bad cheap beer. In fact, for cheap beer this is my "go to". A little "creamy" in it's feel and taste. There is a lot of sugar here and it is a very sweet beer. Not a bad flavor overall for a beer of this low caliber and I appreciate who/what they support. But to the flavor, you can expect, 1) A decent head/lace, 2) A decent appearance, a golden almost lager color, 3) A little malty in it's smell but again, a large amount of sweetness in it's aroma 4) Little aftertaste 5) A large amount of sugar and "creamy" beer, 6) A decent amount of "american ale" flavor....not too much, but a decent amount. I did not feel that this beer was watery like an Old MIlwaukee kind of beer. This is a step above that kind of beer.